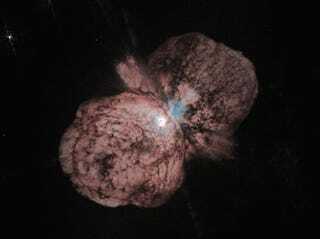 This image of the star Eta Carinae, taken almost two decades ago by the Hubble Telescope, reveals something extraordinary. Though it blew up, releasing as much visible light as a supernova, the star somehow survived. Now it shines at the heart of a debris cloud. In the mid-nineteenth century, the star's explosion made it the brightest object in the southern sky. But Eta Carinae is over 8,000 light years from Earth, which means it actually exploded back when humans still thought that fired ceramics were a major technical innovation.